I am a novice to making caramel, to say the least. I have never made Caramel or Salted Caramel, or had a candy thermometer, until today. I have seen many recipes and versions of Salted Caramel across the web. but which one to use? Dry, (sugar only), wet, (sugar and liquid), even butter, cream, and corn syrup, using a candy thermometer or not using one. My head was spinning. My inner Pisces was coming out, being indecisive, and I just couldn't decide on which recipe to use. I have no trouble making bigger decisions, but it's the little decisions, that drive me crazy. As my Hubby would say, It's a short trip! Some of the recipes I saw didn't use a candy thermometer, and relied on your instincts and your nose. Since I had never made caramel, I didn't have any of those instinct, so I was leary of those recipes.. I finally decided, after three hours of debating in my mind, and driving my husband crazy, to use a recipe that used a candy thermometer, and made thick, glorious caramel. That way, I would have a definite marker on the thermometer, when to take the caramel off of the heat. I had seen the recipe on Monet's blog@ Anecdotes and Applecores. This recipe makes a really thick, rich, caramel sauce, that made a large jar full of caramel goodness. I'm already fantasizing about all the yummy ways to use the sauce. Note: As caramel cools, it thickens. 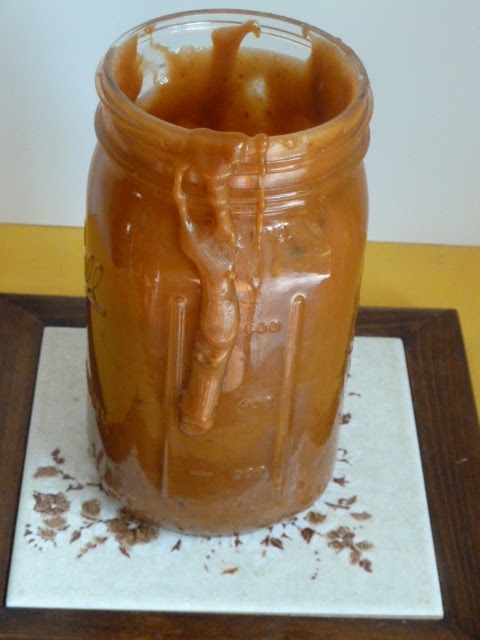 If you aren’t using caramel right away, you can store for 1-2 weeks in a glass jar. When you’re ready to enjoy your caramel, spoon out a chunk (yes, it will be that thick), add a dash of cream, and then microwave in 15 second increments until smooth. 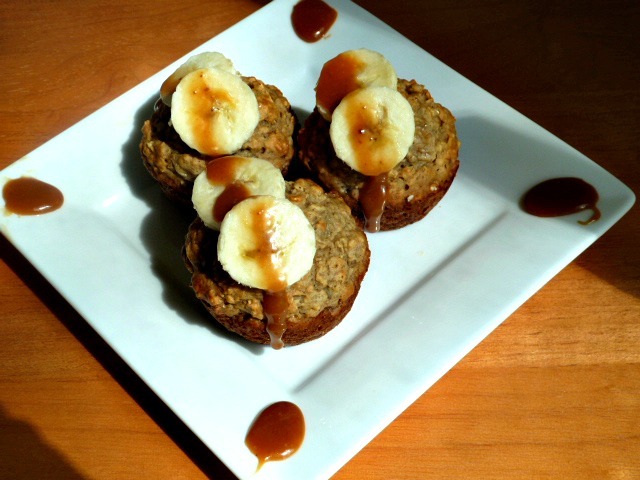 My first way to use the Salted Caramel Sauce was to drizzle on Banana Oat Muffins. These a a great breakfast treat, that are moist from the bananas and applesauce. 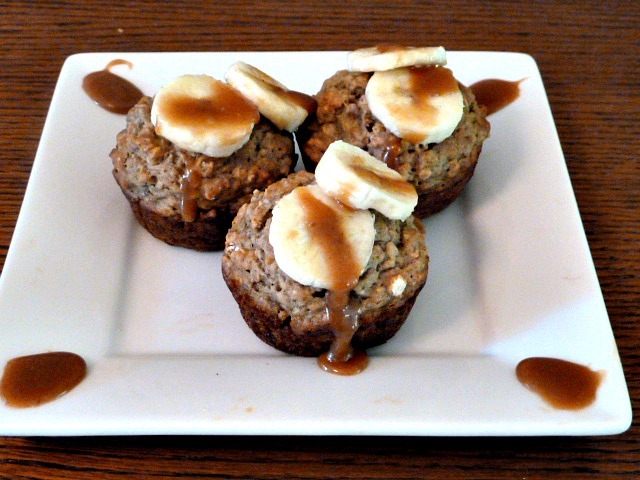 The rolled oats give the muffins a great texture, as well as added fiber, and the Salted Caramel drizzle and the sliced bananas are a flavorful garnish. these muffins aren't overly sweet, so the Salted Caramel Drizzle just adds a touch of sweetness. These would be great for breakfast, snacks, or brunch. Enjoy! Be on the the lookout for more Salted Caramel goodness soon. In a large bowl, beat the egg lightly. Stir in the milk, oil or applesauce, and vanilla. Add the mashed banana, and combine thoroughly. Stir the flour mixture into the banana mixture until just combined. Line a 12-cup muffin tin with paper bake cups, and divide the batter among them. Bake at 400 degrees F (205 degrees C) for 18 to 20 minutes. Cool on rack. Garnish cooled muffins with sliced bananas and Salted Caramel Sauce. Great job!! That caramel sauce looks perfect-and those muffins, yum! The caramel sauce gors so well with the banana muffins. Good lord I want to just lick the screen holy moly delicious! These muffins are so good with the salted caramel drizzle. These muffins are still fairly healthy, but the salted caramel gives them a "touch of class." That thick caramel sauce is just gorgeous! And it tastes so good, too. This sauce is that good! There is the caramel. Oh my Becky it does look good. You know I've never made caramel with a thermometer. I guess that is a good way though to ensure you don't burn it. I wonder though did using brown sugar give it more of a molasses flavor or more like toffee? Maybe next time I'll try this way. Good choice drizzling it over the muffins. Well Gina, I think that it tastes more like toffee. I don't even remember if I have tasted home made caramel sauce. I only know that it tastes so good. Next time, I might try your way;) I have that whole big jar to use in a short time. but, your caramel turned out beautiful! so rich and thick and i am sure it tastes magnificient with these banana oat muffins! This recipe was more definitive with a thermometer to me, than others I saw without out a thermometer. With the thermometer, as soon as the caramel reached 238 degrees F, you took it off the heat. Without a thermometer, you had to rely on your instincts. Too tricky that way. Smile. This made my afternoon! I'm so glad you tried it...and enjoy it. Such a thick and delicious sauce. We ate it straight out of the jar! Thank you for the mention, sweet friend! Thank you for sharing this recipe. I now have a large jar of the magnificent caramel to use many ways. Your muffins sound amazing, but it's your fabulous caramel sauce which guilds the lily! Congratulations on your first caramel sauce...I have a feeling you'll be using that candy thermometer again and again. Thank you! The caramel sauce drizzle really makes these muffins special. and perfect for a brunch. I got a huge jar of salted caramel, so it may be awhile before I make more. Love the muffins, and the sinfully yummy caramel sauce, Becky! The muffins with the caramel sauce are beyond wonderful!